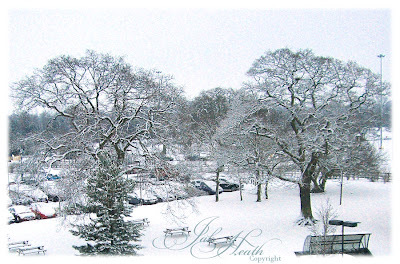 What a surprise I got this morning when I opened the curtains, isn't it gorgeous? A crisp fresh early morning start to the day. A quick photograph before getting ready to head over to the NEC for the Hobby and Stitch Trade Show. I met up with Kirsty Wiseman (bless you Kirsty) a lovely lady that I was thrilled to meet up with and I even managed a try of her precious lip balm. 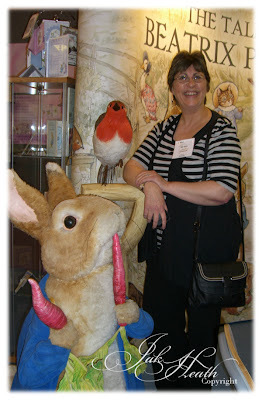 Here I am taking to the animals, just call me Dr Doolittle ha ha, actually this is the Crafters Companion Stand, Beatrix potter no less. 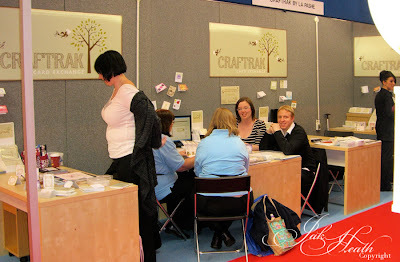 A shot of the team at work on the Craftrak stand, I promise that Toni was not doing a strip, she was merely taking off her cardigan ready to set to work creating a Craftrak card. Gary and Danielle are explaining how Craftrak works & it does work fabulously. Laura is in the background talking through the experience of it all to another trader needing to be part of this exciting new concept to come into the crafting world. Love your photo, Jak. I'm from "up north" also... 'twhas a shock to open curtains this morning to the snow, that's for sure! Love your blog so keep blogging! Oh also love the La Pashe stuff. Very lovely... and love your new motto "ink once, stamp twice"